Chávez reinstated by military loyalists and government supporters. 19 dead and 60 – 150+ injured. The situation began on 9 April, when a general strike was called by the trade union organization "National Federation of Trade Unions", Confederación de Trabajadores de Venezuela (CTV). The proposed strike was in response to Chávez's appointments to prominent posts in Venezuela's national oil company, PDVSA. Two days later in Caracas, up to one million Venezuelans marched in opposition to Chávez. At one point during the march, opposition leaders redirected the protestors to the presidential palace, Miraflores, where government supporters and Bolivarian Circles were holding their own rally. Upon the opposition's arrival, the two sides confronted each other. Gunshots rang out, and by that evening 19 people were dead, including both supporters and opponents of the government. Then, the military high command started the coup at Miraflores and demanded that Chávez resign. President Chávez refused to resign, and he subsequently was arrested by the military. Chávez's request for asylum in Cuba was denied, and he was ordered to be tried in a Venezuelan court. Venezuelan Federation of Chambers of Commerce (Fedecámaras) president Pedro Carmona was declared interim president. During his brief rule, the National Assembly and the Supreme Court were both dissolved and the country's 1999 Constitution was declared void. By the 13th, the coup was on the verge of collapse, as Carmona's attempts to entirely undo Chávez's reforms angered much of the public and key sectors of the military, while parts of the anti-Chávez movement also refused to back Carmona. When word began to spread that Chavez had not resigned, as was publicly claimed, Chavez supporters surrounded the presidential palace. In Caracas, Chávez supporters seized television stations and demanded his return. That night, Carmona resigned and went into exile. The pro-Chávez Presidential Guard retook Miraflores without firing a shot, leading to the removal of the Carmona government and the re-installation of Chávez as president. The coup was allegedly planned for some time, as those who opposed Chávez, such as business lobbies, private media, and Catholic organizations, felt that his government was becoming undemocratic and threatened their commercial interests. At the time, Chávez saw his approval rating of 80% drop to about 30%. The growing dissatisfaction with Chávez among those in the military due to his aggressive manner and alliances with Cuba and paramilitaries also led multiple officers to call on Chávez to resign. Although Chávez initially denied intentions that the United States government sought to overthrow his government, it was later revealed that the US had prior knowledge of the coup attempt and that members of the US government had ties to prominent participants in the coup. The private media was accused of biased reporting in support of the anti-Chávez protests and coup, with coverage being described as "lopsided", as well as "suppress[ed] and manipulate[d]". Allegations that owners of media organizations actively participated in the coup have not been proven. Chávez was first elected president in 1998. One of his campaign promises was to convene a new constitutional convention, and on 15 December 1999 he put the new Constitution of Venezuela to the voters in a referendum, which passed with 71.78% of the popular vote. Following the 1999 constitutional referendum, Chávez was reelected in 2000 under the terms of the new constitution. Following these elections, Chávez had gained control of all formerly independent institutions of the Venezuelan government. The popularity of Chávez then dropped due to his clashes with multiple social groups he had alienated and his close ties with controversial world leaders such as Mohammad Khatami, Saddam Hussein, Muammar Gaddafi and especially Fidel Castro. "Come out to the street and look at me! The more dirt you throw at me, the more I'll throw at you. That is who I am." Chávez used a strategy of polarization in Venezuela, a them against us situation, in order to single out those who stood in the way of his progress. He would insult and use name calling against original supporters that would question him; the media, business leaders, the Catholic Church and the middle class. Such "words spawned hatred and polarization" with Chávez, "a master of language and communication", creating his own reality among Venezuelans. Nelson says that what hurt Chávez's popularity the most was his relationship with Fidel Castro and Cuba, with Chávez attempting to make Venezuela in Cuba's image. Venezuela became Cuba's largest trade partner while Chávez, following Castro's example, consolidated the country's bicameral legislature into a single National Assembly that gave him more power and created community groups of loyal supporters allegedly trained as paramilitaries. Such actions created great fear among Venezuelans who felt like they were tricked and that Chávez had dictatorial goals. This feeling of being tricked especially affected the media since they originally supported Chávez and his promises. Opposition to the Chávez government was then particularly strong, with some of those who were previously in the government before the election of Chávez. The independent media became the primary check on Chávez after he had taken control of most of the Venezuelan government, with the Venezuelan media acting like other forms of media in Latin America at the time that demanded accountability for governmental abuses and exposing corruption. The opposition was worried with Chávez because they believed his rewriting Venezuela's constitution were signs that Chávez was trying to maintain power through authoritarianism. In early 2002, there were also increasing signs of discontent in the military; in February four military officials, including a general and a rear admiral, publicly called on Chávez to resign. On 7 February 2002 Venezuela Air Force Colonel Pedro Vicente Soto and National Reserve Captain Pedro Flores Rivero led a rally protesting the Chávez government's allegedly undemocratic and authoritarian practices. Rear Admiral Carlos Molina Tamayo said on television that if Chávez did not resign, he should be impeached. Besides the opposition accusations that Chávez was undermining democracy and free speech, the military's complaints included Plan Bolívar 2000's use of the armed forces for poverty reduction activities instead of national defense. They also said Chávez was alienating the United States through a foreign policy involving negotiations with Colombian rebels and strengthening links with OPEC countries considered enemies of the United States, including Saddam Hussein's Iraq. Chávez and his allies suggested other motives, including Soto's being passed over for promotion, and pointed to a report in The Washington Post alleging that Soto and Tamayo had received $100,000 each from Miami bank accounts in return for denouncing Chávez. Chávez's opposition originated from the response to the "cubanization" of Venezuela when mothers realized that the new textbooks in Venezuela were really Cuban books filled with revolutionary propaganda and with different covers causing them to protest. By the summer months of 2001, the opposition groups grew quickly from concerned mothers to labor unions, business interests, church groups, and right and leftwing political parties, who felt that they were being isolated. At the same time, groups supporting Chávez became organized, especially among the poor, with their passion for Chávez bordering idolatry since he gave them hope and feeling of being valuable. In 2000, the pro-Chávez National Assembly granted President Chávez emergency powers and the ability to rule by decree through an enabling act to tend to the poor state of the economy. On 13 November 2001, Chávez passed a package of 49 laws, using the enabling act which was set to expire the following day such as rearranging public ministries while also changing major laws in the government, oil businesses and land usage without approval of the National Assembly. The laws "marked a turning point in public sentiment toward the president" with both chavistas and anti-chavistas outraged at the changes. The two decrees in particular sparked protest: a law aimed at strengthening government control over the oil company PDVSA, which Chávez argued had become a "state within a state", and a more controversial land reform law, which included provisions for the expropriation of "idle" lands on large estates. Though the government stated that it would provide the previous owners with compensation at the going market rates, the land laws introduced by Chávez were so vaguely worded that the government could legally expropriate any property it wished to take. While some of the land was genuinely given to the vulnerable, much of it was used in a system of patronage for party members loyal to Chávez. McCaughan described the 49 laws as the "plus ultra non", the "point of no return for Chávez's troubled relations with business, church and media leaders". For the opposition, such dramatic changes to the government proved to them that Chávez was a "dictator-in-training". Opposition to these programmes included an attempt by Democratic Action to have the Supreme Court assess Chávez for potential mental incapacity, which would permit his removal from office under Article 233 of the new constitution. On 10 December 2001, a national strike shut down 90% of the economy and was the largest strike in Venezuela's history, bigger than the strike that assisted with ending the dictatorship of Marcos Pérez Jiménez in 1958. By January 2002, protests involving hundreds of thousands of Venezuelans opposing Chávez became common in Venezuela. In March 2002, Petróleos de Venezuela (PDVSA), the state oil company that acted somewhat autonomously and accounted for 70% of Venezuela's foreign revenue, was targeted by Chávez out of fear of the oppositions ability to call national strikes and was to receive strict control from the government. Chávez's attempts to end the functional independence of PDVSA and to bring its oil revenues under state control were met with strong resistance from PDVSA officials and managers. Many supported the old Rafael Caldera-era policy of apertura, that is, opening the Venezuelan oil sector to much greater foreign participation, to raise production; Chávez argued instead for cutting production, with coordination via OPEC, to raise prices and increase oil revenues. Chávez suspected apertura supporters of ultimately wanting to privatize the company, and the government attacked PDVSA management saying it was diverting too much of its revenues into its own pockets (PDVSA royalties paid to the state had fallen from 71% of gross earnings in 1981 during the peak of Venezuela's economy to 39% in 2000 following decades of financial hardship). On April 7, Chávez fired the President of PDVSA, Brigadier-General Guaicaipuro Lameda Montero and replaced him with "a former Communist Party militant", in addition to firing another 5 of the 7 members of the PDVSA board of directors on his Aló Presidente program, mocking each worker by name and used a whistle "as if to eject them from a soccer match". Such actions by Chávez caused further anti-Chávez developments with a series of walkouts and work slowdowns followed. The Washington Times then noted that Chávez had "choked off foreign investment by doubling the royalty payments oil companies must pay to the government and by restricting corporate ownership on some oil projects to 49 percent", and had "alienated workers at his country's state-owned oil company, Petroleos de Venezuela, by replacing long-serving professionals with his supporters". By early 2002, Chávez's approval rating dropped to around 30%. This action, according to The Los Angeles Times, "united all the anti-Chávez forces", bringing together labor leader Carlos Ortega with Pedro Carmona Estanga, head of Venezuela's largest business federation, Fedecámaras, in a call for an "indefinite general strike" in support of oil workers. The existing military grew wary of Chávez due to his relationship with Fidel Castro and the Colombian guerrilla group FARC that they were previously taught "were the greatest threat to their country". The military felt that after fighting against Castro's influence, guerilla groups and attempts to overthrow previous Venezuelan governments to expand his revolutionary presence since the 1960s, that they had finally lost when Chávez came to power. Chávez promoted guerilla fighters into the Venezuelan military and forced the wary existing military servicemen to assist them. One of the more controversial actions that created discontent within the military was when Chávez forced them to assist the FARC with setting up camps in Venezuelan territories, providing ammunition to fight the Colombian government, supplying ID cards so they could move freely through Venezuela and sending members of Bolivarian Circles to their camps to receive guerilla training. The most controversial steps taken by Chávez was ordering the existing military to work with the Cuban military, with the Venezuelan military and intelligence agencies forced to open their bases, files and hard drives for their Cuban counterparts creating a sense of being betrayed by Chávez. The "long-simmering resentment in the military"[attribution needed] was articulated publicly by four high-level officers, including Air Force Gen. Roman Gomez Ruiz, who called on Chávez to "resign peacefully and take responsibility for your failure". Chávez responded by declaring these officers traitors, ordering their arrest, and forcing their resignations. The Chicago Tribune later reported that although the Venezuelan general public was unaware of it, the country's oil industry was approaching the end of a six-week work slowdown and Chávez's government and oil executives had agreed that members of an oil board picked by Chávez would resign. "But labor and business leaders, who had joined in secret with dissident military officers in an effort to oust Chávez, decided that the moment had come to press on", the newspaper maintained. "The middle-class intellectuals and professionals who had at first delighted in Chávez's talk of restoring 'national honor'", Sandra Hernandez later observed in The Los Angeles Times, "watched in dismay as Chávez's supporters formed 'Bolivarian circles', muscle groups that intimidated government opponents with threats of physical harm". During the year or so preceding the coup, Chávez "essentially thumbed his nose" at his opponents, claimed a political consultant. Many opponents of Chávez felt that his behavior was self-destructive and that he would end up "los[ing] power through constitutional means via the Supreme Court or the parliament". Nonetheless, according to The New York Times, "discontented military officers had been meeting among themselves and with business leaders for almost a year to discuss ways to oust Mr. Chávez". These military officers "said they would pick the leader", one officer[who?] said, because "They did not want to be called a military junta, but they wanted to make sure that at least one military person was on the transitional board." Details surrounding a potential coup were openly discussed in the Venezuela for months before the attempted ousting. "The rumors of a coup to oust Chávez", noted The Miami Herald, "were being whispered, if not shouted, for months before the revolt". Writing about the run-up to the coup, Letta Tayler of Newsweek observed that "[o]ne of the few certainties" about it was "that military, business, union and civic leaders had been plotting Chávez's downfall for nearly two years". According to former United States Ambassador to Venezuela, Charles S. Shapiro, the United States had known about a potential coup since late 2001 and that weeks before the coup, he had attempted to dissuade Venezuelan trade union organization from participating, saying the United States would not support such actions and would only accept the change of government by electoral means. On the evening of 11 April, with the coup in full swing, one coup plotter, Colonel Julio Rodriguez Salas, told television viewers that the coup had been long planned: "Nine months ago a movement started to organise itself more firmly, a serious movement, and fortunately it has come to fruition today." The Guardian reported that as early as 18 March 2002 that "Chávez was saying that he was aware of a plot" to overthrow him, and that in the days before 11 April, "the political temperature was approaching boiling point", with oil workers striking "in protest at Chávez's appointments to their board" and the media accelerating its criticisms of the regime. The Chicago Tribune reported that there had been rumors in Caracas "for weeks" about a coup, with military figures like Navy Vice Adm. Carlos Molina and Air Force Col. Pedro Soto "building support ... in the armed forces" for a coup. Hernandez claimed that in early April, "the coming coup ... was an open secret". On April 9, retired Gen. Manuel Andara Clavier, one of many retired military officials who opposed Chávez, reportedly told her, "The table is set. ... Everything is set for the military to let the president know he can't push this country to spill blood." Shortly before the coup attempt, Alí Rodríguez Araque, a former guerrilla and Chávez ally then serving in Vienna as the General Secretary of OPEC, allegedly heard of a potential oil embargo against the United States by Iraq and Libya, over US support for Israel. More importantly, he heard that "the United States was planning to prod a coup into action in Venezuela to head off any threat of embargo". Rodríguez Araque's warning led Chávez to declare that he would not join such an embargo, and to secretly hide several hundred troops in Miraflores' underground corridors, commanded by José Baduel. On 7 April, the same day that President Chávez fired the PDVSA officials, Chávez met with his cabinet and high level military officials and began the meeting calling the actions by the opposition "treasonous" and asked those gathered how to counteract such actions. Soon discussions arose on how to defend Miraflores Palace. There were recommendations declaring a state of emergency, beginning the censorship of television and declaring martial law. Chávez then began to discuss Plan Ávila with Manuel Rosendo, the head of the Unified Command of the National Armed Forces, and how to implement it, though the military command did not accept it. The Tactical Command, headed by Cilia Flores, Guillermo García Ponce and Freddy Bernal, then shared plans of using the Bolivarian Circles as a paramilitary force to end marches and also defend Chávez by organizing them into brigades. Another plan was to have the National Guard raid the offices of PDVSA in Chuao and occupy the company by force. They also discussed launching a disinformation propaganda campaign on public and private television and having government loyalists fill the highways with their vehicles and then present the images on TV as if people were busy working like any other day. In another plan to end the strike, Gastón Parra, the president of PDVSA, suggested to give bonuses to PDVSA employees who chose not to participate in the strike. In a 9 April discussion between Finance Minister General Francisco Usón and General Jacinto Pérez, Pérez believed that the Bolivarian Revolution was in a crisis and needed to "rejuvenate itself". Pérez then stated that the Bolivarian Revolution need had to be "purified with blood", which concerned Usón since Pérez "had the president’s ear". Both discussions outraged generals since they believed that the Venezuelan government was proposing violence against the public with General Rosendo stating that it seemed that "Chávez actually wanted a confrontation, that he had picked the fight with PDVSA in order to precipitate a crisis". On 10 December, the opposition organised a one-day general strike, which was substantially effective, although shops in poorer neighborhoods remained open. With newspapers, workplaces, schools and the stock exchange closed, "the opposition was ecstatic ... [and] ... convinced themselves that Chávez's support had all but vanished". [attribution needed] On 5 April 2002, the PDVSA opposition to Chávez moved to shut down the company. Thousands of anti-Chávez PDVSA employees, and two of the five main export terminals were paralyzed. On 6 April the Confederación de Trabajadores de Venezuela (CTV) trade union federation announced a 24-hour general strike for 9 April, to support the PDVSA protestors. It was joined the following day by Venezuelan Federation of Chambers of Commerce, headed by Pedro Carmona and Fedepetrol, the country's "largest blue-collar petroleum union". As in the December general strike, the country's most powerful business group and largest trade union federation acted together. On 7 April, Chávez fired seven PDVSA executives who had been leading the protests, and forced another 12 into retirement. Tensions continued to escalate through March and early April. The mayor of Caracas, Alfredo Peña, a former Chávez ally, said that Chávez was possessed by evil spirits, and called on the Catholic Church to perform an exorcism. Days after the firing of PDVSA heads, on 9 April, the general strike was moderately successful and oil production slowed. Newspapers were not published and television stations cancelled regular programming and commercials to run continuous coverage of the strike, including the stations' own anti-Chávez ads. The strike organizers declared it a success, which the government disputed, and in an effort to show its version of events, ordered a series of "cadenas" (mandatory government broadcasts), showing daily life continuing (over 30 cadenas on 8 and 9 April). On the evening of 9 April, the strike was extended for another 24 hours. On 10 April, the strike was less effective, with many schools and businesses re-opening. As with the previous day, television provided continuous coverage, and the government intervened with cadenas – but this time the networks split the screen, showing the cadena on one side and their coverage of the strike on the other. On the evening of 10 April, Fedecámaras and CTV held televised news conference announcing that the strike would be extended indefinitely, unanimously voted for a "coordinating committee for democracy and liberty" in order to "rescue" Venezuela's freedom. The opposition then called for a march to the PDVSA headquarters the following day. In the National Assembly, those close to Chávez stated that Chávez wanted "moderation" though if an unlimited general strike were to occur from the opposition, an "unspecified 'violence will occur'". Brigadier General Néstor González then appeared on television to demand Chávez's resignation and to issue an ultimatum. The statement had the desired effect of ensuring that Chávez cancelled his planned trip to a Rio Group summit in Costa Rica: the coup plans supposedly required Chávez to be in Venezuela. The message was recorded in the house of Napoleón Bravo, host of Venevisión's 24 Horas, as Bravo admitted on air on 12 April, in a discussion with Rear Admiral Molina Tamayo. Also on 10 April, a draft of what would become the Carmona Decree was allegedly shown to the leading intellectual Jorge Olavarría for comments. Olavarría warned that it violated democratic norms and would provoke an international reaction. The crisis that triggered the coup came when "workers and business leaders", infuriated by Chávez's "meddling in the state oil company", as the Chicago Tribune put it, joined in "calling for a general strike that cut exports" in support of striking oil workers. The strike began, according to The Washington Post, "as a managerial protest at the state-run oil company, but evolved into a broad effort supported by the country's largest business and labor groups to force Chávez from power." After days of general strikes and protests involving thousands of Venezuelans, on 10 April, a speech was held at the CTV headquarters, where CTV and Fedecámaras held speeches that involved a Brigadier General denouncing Chávez's alleged involvement with FARC, and the announcement of a march the next day with the possibility of an indefinite strike. The march on 11 April was to begin at 9:00am, starting at Parque del Este and ending at the PDVSA headquarters. On 11 April, just hours before an operation to take over the PDVSA by force was to begin, General Rosendo, knowing the consequences of such an action, talked Chávez out of the plan. Later that day, hundreds of thousands to millions of Venezuelans marched to the PDVSA headquarters later that day in defense of its recently dismissed management board. Chants of "Miraflores! Miraflores! Miraflores!" could be heard throughout the march with participants calling for a march to the Miraflores Palace. The organizers of the march had planned to announce a "spontaneous" decision to reroute the march and "descend on Miraflores presidential palace to force the president to resign". By late morning, speakers at the rally at PDVSA headquarters called for a march to Miraflores, and the crowd approved and began the six-mile march. The march was re-routed without consultation with the police, who legally had to approve the changed route. [better source needed] The government, upon seeing how events were unfolding on television, called for a halt in the progress of demonstrators so that the very real possibility of a violent confrontation taking place between the marchers and thousands of Chavistas already gathered there at the palace might be avoided. "I don't think there was any intention of a coup", Carlos Ortega, president of the Venezuelan Workers Confederation, later told The Los Angeles Times. Newsday indicated that it was Ortega and other protest leaders who called for participants to march to Miraflores. "Many marchers said they thought the call to proceed to Miraflores was spontaneous", reported Newsday, but some planners "said the idea had always been to bring crowds to Miraflores to demand Chávez's resignation once they had sufficient turnout and a pledge from the military that it would second their call for his ouster". At the palace the protesters shouted "Chávez Out!" The New York Times quoted Ortega as shouting: "Chávez get out! ... We do not want you! We reject you!" Shortly after the protesters arrived at Miraflores, Chávez issued a call for calm on national TV. According to an opinion piece by Sandra Hernandez, opposition TV aired images of anti-Chávez protesters outside the palace being beaten by troops. Hernandez wrote that on 11 April, she was interviewing General Guaicaipuro Lameda, who had resigned in February as president of Venezuela's state-run oil firm "to protest Chávez's autocratic management style", when an aide interrupted to say that he had to take a call from a family member. When Lameda hung up, he told Hernandez that the call "was from an officer who was present when an order was issued to send the military intelligence police after him". Lameda assumed the police were coming "to prevent him from appearing on television later in the day, when he planned to appeal to the military to choose sides in the growing tensions between Chávez's supporters and his opponents". Lameda was not calling for a coup, he said, although he and other opponents of Chávez hoped that anti-Chávez demonstrations would grow so large that Chávez would have to crack down, whereupon the military would be faced with the decision of whether to enforce his orders or not. Close to Miraflores, a line of police and National Guard held the marchers for a time, before the marchers pressed on led by Metropolitan Police on motorcycles. Chavistas belonging to Bolivarian Circles, some with that had military training in Cuba, were also stationed outside of Miraflores. The Circles had been positioned outside of the palace throughout the week during the unrest. Government officials used the hours it took for the march to travel 5 miles to the palace to call on loyalists to gather at Miraflores, with National Assembly Deputy Juan Barreto telling loyalists through the media covering the situation "The call is to Miraflores! Everyone to Miraflores to defend your revolution! Don't let them through!" Some government supporters who then began to gather were armed with Molotov cocktails, rocks, sticks, chains, baseball bats, and metal pipes and were ignored by the Venezuelan National Guard stationed to defend Chávez. According to General Rosendo, Defense Minister José Vicente Rangel ordered Freddy Bernal to prepare the Bolivarian Circles to attack the opposition demonstration. "Rosendo, we are going to direct the operations from here [Miraflores] ... Plan Ávila ... And I have my rifle ready to put lead in anyone who tries to stop this revolution that has cost me so much." At about 12:00pm, Chávez knew the march was on its way and believed a coup was about to be attempted so he called for the implementation of a military plan to occupy key locations in the city, Plan Ávila, the plan first used by Carlos Andrés Pérez during the Caracazo that resulted in the killings of hundreds and possibly thousands of Venezuelans. This caused discomfort among some in the military since they knew that Chávez was violating the constitution he helped create by ordering High Command to have the military control civilians. By 12:30 pm, thousands of government supporters were gathered around the palace blocking all routes to Miraflores except for the Llaguno Overpass, which was where the Bolivarian Circles had gathered to overlook the route. As the march turned a corner and began to approach the Miraflores at about 2:00 pm, the National Guard fired about 12 tear gas canisters from behind the palace walls and the protesters fled back down the road. As more marchers pressed toward Miraflores, the leaders of the protest, Guaicaipuro Lameda and Rear Admiral Molina Tamayo, "kept calling on them to surge forward for a direct assault on the palace about two hundred yards away" and urged the crowd to advance through the tear gas about 20 minutes after the initial confrontation. The protesters made it closer to Miraflores and the Presidential Guard responded with more tear gas, about 20 gas canisters causing panic and a dispersion of the demonstrators to areas surrounding the palace. At about 2:30 pm opposition protesters began to throw objects at the National Guard and the Chavistas a block away; some were thrown back, and the opposition and the Chavistas exchanged insults. Since other routes were blocked by the National Guard, many marchers began to head down Baralt Avenue in order to reach Miraflores. On Baralt Avenue, near the Llaguno Overpass as the march inched closer hundreds of Chávez supporters gathered and began throwing large rocks, Molotov cocktails and even tear gas at the demonstrators. As marchers and Chavistas clashed, the Metropolitan Police attempted to separate both sides from further confrontation with two trucks with water cannons. Police motorcycles pushed the opposition towards the Chavistas, and as a police tank turned onto the main street, gunfire broke out shortly after 3:00pm. By that time, Lameda, Molina Tamayo, Carmona, and CTV leader Carlos Ortega had already left the area. A few minutes after Chávez's broadcast at 3:45 pm, gunfire erupted again and the march began to disperse slightly. As the demonstrators marched closer to the Llaguno Overpass, they could see Chavistas heavily armed, some with pistols. Police began to disperse the Chavista gunmen returning fire and few demonstrators began to follow behind them with pings of gunfire heard on the police armored vehicles, though the marchers fled shortly after as the violence grew. Only when Chávez emerged from the broadcast did he learn the extent of the violence. According to medical staff at the Vargas Hospital, the first to arrive at the hospital were opposition marchers. According to surgeons, the marchers had been shot in the back with handgun fire while fleeing and others were severely injured from 7.62×51mm NATO military rounds from Fal rifles, standard equipment of the National Guard defending Chávez. Later after police responded to pro-Chávez shooting, Chávez supporters then began being seen injured in the hospitals. As a result of the confrontations, between 17 and 19 were left dead and around 60 injured, most killed between 3:20 pm and 3:55 pm. Immediately after Chávez finished his broadcast at 5:25pm he changed into his military fatigues and grabbed his rifle and pistol worrying about rebels entering the palace. Chávez believed that the best way to stay in power was to implement Plan Ávila, a constitutionally banned military contingency plan that was created to maintain public order in Caracas that left hundreds to thousands of Venezuelans dead during the Caracazo. Since General Rosendo would not comply earlier in the day with Chávez's order to implement Plan Ávila, Chávez went directly to General Jorge García Carneiro, one of his most trusted generals and ordered him to go through with it. "The killings at the anti-Chávez demonstration rocked the country", The New York Times reported on April 20, "reviving memories of the violent events in 1989, known as the Caracazo, in which hundreds were killed by government forces. Venezuelans across the political spectrum swore that such violence would never take place again." Five minutes after Chávez's broadcast finished, Lameda and Molina Tamayo went on the air at Venevisión, where many opposition leaders had gathered, and, blaming Chávez for the violence, urged the armed forces to intervene. Shortly after 6:00pm, word spread at Fort Tiuna that Chávez-loyalist General Carneiro was still seeking to implement Plan Ávila. Head of the army General Efraín Vásquez Velasco was meeting at the Army School with other officers concerned about Chávez's use of violence when Chávez ordered General Carneiro, one of Vásquez Velasco's subordinates, to go ahead with Plan Ávila. Vásquez Velasco, who founded the Office of Human Rights of the Venezuelan Army, knew that if the plan were implemented that he would be blamed since he was the head of the army. Soon after, General Vásquez Velasco learned that General Carneiro did not comply with his orders and was sending about 20 tanks to Miraflores to support Chávez. Vásquez Velasco called the tank commander ordering him to return with the commander complying with the general. General Vásquez Velasco then ordered a nationwide military lockdown with military movements requiring written documentation and approval, a move by Vásquez Velasco that was to prevent troops loyal to Chávez from suppressing the march and would also deter rebellious attacks from the military against Chávez. Vásquez Velasco then ordered the Chávez-loyalist General Carneiro be arrested before he could arrest the other officers under Chávez's orders, but Carneiro complied with Vásquez Velasco. At 6:30, leaders of business and labor pulled their support from Chávez and by 6:45 pm, "Navy Chief of Staff Vice Adm. Hector Ramirez Perez and nine other generals and admirals who had been talking since July about pressuring Chávez into changing his ways decided to rebel and go public", according to The Miami Herald. "Even many military officers who were neutral in their feelings about Chávez were persuaded to turn against the president after Thursday's massacre", The Chicago Tribune later reported. "Soon press conferences flooded the airwaves as dozens of officers, more than 50 in all, denounced the president." At around 7:30 pm, Venevisión began broadcasting its version of events that afternoon, showing the Chavistas firing from Puente Llaguno, juxtaposed with footage of dead or wounded protesters, and accusing the Chavistas of shooting unarmed opposition protestors and of having planned an ambush. This showed General Vásquez Velasco and other generals that Chávez had ordered the Bolivarian Circles to attack opposition marchers. The military officers, including General Raúl Baduel, a founder of Chávez's MBR-200, then decided that they had to pull support from Chávez to deter another massacre and shortly after at 8:00 pm, Vásquez Velasco, together with other ranking army officers, declared that Chávez had lost his support. This was followed by heads of the Venezuelan Air Force and Navy, with Chávez then losing power of the military. By 8:30 pm, Luis Miquilena, Chávez's mentor and a respected individual among his government being described as "the most important civilian who supported the Chávez government" pulled his support from Chávez stating, "I solemnly declare that it is very difficult that a government of this nature could ever count on the possibility of help on my part ... (the government) had ended up stained in blood". Following this, Chávez had also lost the support of the legislative and judicials branches who supported Miquilena. Infuriated by the slaughter but "reluctant to stage an outright coup", according to The New York Times, a group of military officers who called themselves the "Movement for the Integrity and Dignity of the National Armed Forces" demanded on Thursday evening that Chávez resign. In a statement, they declared that they had no longer had "recognition" of Chávez, whom they accused of "betraying the trust of the people" and held responsible for the deaths of peaceful protesters. The statement was read at a press conference by Vice Adm. Hector Ramirez Perez, chief of staff of the Venezuelan Navy and chairman of the joint chiefs of staff, and signed by a number of other officers, including 10 senior officers of the Army, Navy, Air Force and National Guard, later described by The New York Times as occupying "largely administrative posts". Other signatories included the heads of the paramilitary National Guard and "several midlevel commanders based in the capital". Perhaps the most prominent member of this group was Gen. Efrain Vásquez, Commander in Chief of the Army, who said, "Mr. President, I was loyal to the end, but today's deaths cannot be tolerated." He also told reporters that no coup had been planned before April 11 but that the massacre had been "too much and we had to move". Navy Vice Admiral Hector Rafael Ramirez agreed, saying, "We cannot allow a tyrant to run the Republic of Venezuela." Chávez sought to get out his version of the events, but struggled to do so. Venezuelan television refused to interview any government officials, and the government was left with broadcasts from Miraflores via the state-run Channel 8 (Venezolana de Televisión, VTV). By 10 pm this too was gone, as police loyal to Miranda governor Enrique Mendoza took it over, its employees putting on an old nature documentary before leaving. Shortly before the takeover, Mendoza had said "this channel 8 crap needs to stop". At 10:20 pm National Guard general Alberto Camacho Kairuz declared on television that Chávez had "abandoned" his office. This was not the case; Chávez was in Miraflores, contacting ambassadors from a range of countries to keep them informed and seek their help as mediators. Around this time, Chávez contemplated about committing suicide. Near midnight, Fidel Castro called, and urged him not to kill himself and to turn himself in to the military, with José Vicente Rangel later stating that "the call from Fidel was decisive so that there was no self-immolation. It was the determinant factor. His advice allowed us to see better in the darkness." In the early hours of 12 April, many demanded Chávez's resignation. With the loss of "almost all ... military force on hand in order to resist or move to another place", Chávez said that he would consider it to avoid a potential bloodbath if there were disturbances involving the crowds outside Miraflores. However, he declared that four conditions would have to be met, including that he be allowed to resign before the National Assembly, with power passing constitutionally to the Vice President prior to new elections, he and his family could go to Cuba and that he would be able to address the nation live on television. But Vásquez and others would not agree to these conditions and dispatched two generals to arrest Chávez. At 3 am, with the coup plotters threatening to bomb the Miraflores palace if Chávez did not resign, Chávez phoned the head of the armed forces, General-in-Chief Lucas Rincón saying that he would do so; he in turn told him that the military leadership was divided on whether to oust him or not. Within twenty minutes Rincon had announced on television that Chávez had been asked for his resignation, and had accepted. A few minutes later, Chávez was told that the four conditions he had declared would no longer be accepted, and Chávez declared that he would surrender himself to the coup plotters as "president prisoner". Chávez later said that he told Rincón during their telephone call that he would "abandon" the presidency, after which he "left the palace to negotiate the terms under which he would do so", saying, "I am ready to go, but I demand respect for the constitution." At Miraflores, according to The Los Angeles Times, Chávez dispatched Rincón, his military chief of staff, to meet with the military officers at Fuerte Tiuna who were calling for him to step down. Rincón called Chávez from Fuerte Tiuna to say that the officers were "fighting among themselves" and insisting on his resignation. As The Chicago Tribune put it, "top military commanders", unable to countenance "the spectacle of a president making war on his own people", demanded that Chávez step down. Faced with this demand, Chávez "started working the phones" and also summoned a clergyman, Monsignor Baltazar Porras, to discuss "prayer and forgiveness", his purpose being "maybe as much to search his soul as to search for a way out of the crisis". Porras, whom Chávez had once reviled as one of the church's "devils in skirts", said that Chávez had "personally asked me for forgiveness for everything he had said about me". General Vásquez ordered several generals to go to Miraflores and arrest Chávez. Meanwhile, according to Newsday, "cabinet members and honor guards sat glumly in the hallway outside ... Chávez's suite", awaiting news. Shortly after midnight, Environment Minister Maria Elisa Osorio said, "The president is being forced to leave. There's a coup." Faced with his officers' demand, Chávez refused to resign but agreed to "abandon his functions", a procedure that is provided for by Venezuelan law but that would need to be ratified by the National Assembly. There followed "hours of negotiations" in which the "key figure" was Armed Forces Commander Gen. Lucas Rincón Romero, who did not make clear at any point during the crisis where his loyalties lay. Early Friday morning, Rincón told the public, incorrectly, that Chávez had resigned. An hour and a half later, Carmona was named president of what was meant to be a transitional government. On Friday morning a "heavily guarded caravan" took Chávez, who was "wearing his trademark fatigues and red beret", from Miraflores to the army base at Fort Tiuna. At the base, Chávez was forced to take off the uniform and beret and dress in civilian garb. (The Miami Herald noted that armed-forces officers had long been irked by his by his habit of wearing a military uniform during his presidency.). Here he met with representatives of the Roman Catholic Church. "By midmorning on Friday", reported the Times, Chávez "looked to be finished". The military later maintained, according to The Guardian, "that the civil unrest forced them to ask Chávez for his resignation, which he gave verbally, asking to be flown to Cuba". The Cuban government was trying to arrange for him to go into exile in Cuba. Chávez's request to be allowed to go into exile in Cuba was soon rejected, however. Army General Roman Fuemayor said: "He has to be held accountable to his country." Meanwhile, according to the Miami Herald, "Bernal, Vice President Diosdado Cabello and several other Chávez cabinet members were reported to be trying to win political asylum in foreign embassies, including those of Chile, Cuba, Iraq and Libya." Police, alert to reports that Chávez supporters in the Caracas slums were distributing weapons, began searching for guns in homes. Meanwhile, Rincón, "in full uniform", had announced on national television at about 2 a.m. that the president had resigned. Rincón denied that a coup was underway. Instead, Chávez would be taken to La Orchila, a military base off the coast of Venezuela, until rebel leaders could decide Chávez's fate. Whilst being held at Fort Tiuna, Chávez had access to television and saw the rolling television claims of his resignation, and became concerned that he would be killed (and the death made to look like suicide) in order to keep the narrative clear. He was able to get word out that he had not in fact resigned, via a telephone call to his daughter, who, via switchboard operators at Miraflores still loyal to Chávez, was able to speak first to Fidel Castro and then to Cuban television. After two young female military prosecutors interviewed Chávez at Fort Tiuna on Friday morning about the 11 April massacre. Chávez later described the young women as "valiant". In an interview with the two women from the military's legal department, Chávez reiterated that he had not resigned, and they faxed a copy of his statement to the Attorney General, Isaias Rodriguez. To make the news public on Venezuelan media, Rodriguez called a press conference, supposedly to announce his own resignation. Instead, on 12 April at 2 pm, he announced live on television that Chávez had never quit, and was being held illegally. Most of his statement was cut off, with Venezuelan networks returning to the studios. In the evening, Chávez was flown to the remote naval base of Turiamo, near Puerto Cabello, where he considered the risk of his own murder/assassination. According to Chávez, at one point an officer declared to another, "If you kill the president here we'll all kill one another." On 13 April, with the critical support of top military officer Raúl Baduel, and with Chávez supporters having retaken Miraflores and the soldiers holding him now calling him "President", Chávez wrote a note from his captivity in Turiamo stating specifically that he had not resigned. Early on Friday, Carmona was sworn in as interim president. Businessman Pedro Carmona Estanga, president of Fedecámaras, was installed as interim President after Chávez's detention. Carmona, described by The Miami Herald as "president for a day" told the newspaper that his acceptance of that position was, in the Herald's paraphrase, "as a spontaneous act of bravery, not the result of a monthslong conspiracy". "I was not involved in any conspiracy", Carmona said. "I cannot accept any conjecture or soap operas. I categorically deny it." The Chicago Tribune said Carmona was "a buttoned-down businessman and economist who has degrees from Caracas' Andres Bello Catholic University and the University of Brussels" and who "has an international reputation, having represented Venezuelan commercial and diplomatic missions abroad". Describing Carmona as "a bookish economist" who had worked with the Foreign Ministry and "run a variety of trade associations", The Washington Post said that one reason he was chosen as interim president "was that he was one of the few people who didn't want the job". One condition imposed by the coup-makers was that the interim president would not be able to run for president in elections several months later, and those who really wanted the long-term position therefore took themselves out of the running for the interim post. Invited to be president by those who had deposed Chávez, Carmona had become nationally prominent as the leading figure in the previous December's general strike. The Miami Herald reported that even Chávez had described Carmona as "straightforward and low-key – until schemers manipulated him". According to Venezuelan political analysts, Carmona was always a "moderate" and "conciliatory" figure, but in the years before the 2002 coup he "became more aggressive as Chávez did". Margarita Lopez Maya of the University of Central Venezuela said that as Carmona rose through the ranks of Fedecámaras, "he became more aggravated, a situation which got worse because the government was provoking everyone". Upon Carmona's taking office, Juan Calvo, a Venezuelan businessman, said, "He always surrounds himself with capable people, and I'm sure that's what he will do now." Upon being sworn in, Carmona told supporters that "We must go about returning to the rule of law ... Strongman rule will be left behind. I will act in the most open manner, working with all sectors of the country." He also said that he required plenty of support "to obtain the conditions required to rebuild confidence in the country and improve its international image". In addition, he vowed that "justice would be done" for the survivors of those who had been massacred. Shortly after police confiscated scores of weapons from several Bolivarian Circles, including from a group at the Ministries of Health and Environment that was near Miraflores. One of the immediate changes Carmona made after his inauguration was to change his country's official name back to the Republic of Venezuela from the Bolivarian Republic of Venezuela, the name established by the 1999 Constitution. News of this change was greeted with loud cheers from coup supporters at Miraflores. Edgar Paredes, interim head of Petróleos de Venezuela, announced that Venezuela would no longer be selling oil to Cuba. Moreover, Carmona's government repealed the 49 laws passed the previous November that business leaders considered damaging to the economy. Meanwhile, pro-Chávez officers in the military were being removed from their positions or assigned to remote locations. Carmona then issued a decree, which came to be known as the Carmona Decree, dissolving the National Assembly and Supreme Court that were filled with Chávez supporters, and voiding the 1999 Constitution. The decree declared that new elections for a "National Legislative Power" would take place no later than December 2002, and that this would draft a general reform of the 1999 constitution; new "general national elections" would take place within a year of the decree's declaration. The decree also suspended the Attorney General, Controller General, state governors and all mayors elected during Chávez's administration. He also suspended the power of other branches of government and dismissed Chávez appointees while forming a new council, most of whose 25 members were Chávez opponents. As one academic and Chavez supporter, Barry Cannon later put it, "all institutions were abolished leaving the country effectively without the rule of law." Carmona also reinstalled Guaicaipuro Lameda as head of PDVSA. PDVSA management swiftly announced the end of oil exports to Cuba, and declared that it would step up production, implying an end to cooperation with OPEC. The removal of such officials was controversial, with one member of the anti-Chávez coalition stating that "In hindsight, it was the most idiotic thing that could have been done, ... But we had just come out of an ambush and we were venting our distaste for the people who occupied those positions, so everyone applauded the dissolution." "The way the provisional government abandoned the constitution produced a very strong reaction – it was a big mistake" said Congressman Felipe Mujica, member of a socialist party that had broken with Chávez but been excluded from the new government. "That, and the way they were pursuing his political allies, arresting them, created the impression that this was not the right way." Such actions fragmented the broad anti-Chávez coalition which had supported the coup, with many viewing it as "the triumph of a small oligarchic elite". "Carmona was really placed in a trap" Anibal Romero, a Venezuelan political science professor, told The Los Angeles Times. "He couldn't leave the National Assembly in power and govern the country, because it was full of Chávez supporters. But if he dissolved it, he would be declared anti-democratic." Another mistake was that, although he had spent months working closely with labour leader Carlos Ortega, he appointed no labor leaders to his cabinet. Carmona's appointment to cabinet positions of members of Opus Dei, the Catholic organization, and of members of what The New York Times called "a discredited conservative party" concerned many democratic members of the anti-Chávez coalition, and made many of them feel "they were being aced out of power by Carmona" reported the Times. The military members of the coalition were also displeased that Carmona did not consult them on military appointments. Carmona also named two naval officers, but no army officers, to the cabinet, bypassing Vásquez and instead naming Adm. Hector Ramirez Perez as Minister of Defense. "The army would never accept a navy officer in that job" Ret. Vice Adm. Mario Ivan Carratu later said. "It has always been that way." When he named Gen. Rafael Damina Bustillo to be head of the National Guard, Gen. Vásquez insisted angrily: "The officers who are with me ... will remain here." By midday Saturday, as The Washington Post later reported, "key military leaders were growing concerned" about many of Carmona's actions, unconstitutional and otherwise. "[I]n style and substance", the Post noted, "the new government quickly alienated civil groups and key elements of the armed forces, which are proud of a history of support for Venezuelan democracy." It was also reported that there was considerable competition within the coalition. "There were many more people with aspirations than space to accommodate them, and they all seemed ready to jump ship when they felt they were being excluded" said Janet Kelly, a Veneuelan political commentator. Columnist Patricia Poleo of the Caracas newspaper El Nuevo Pais joined several government officials when she later suggested that during Carmona's tenure, Isaac Perez Recao, a member of a family that owned a controlling stake in a firm called Venoco, a subsidiary of which Carmona ran, had allegedly been a key financier of the coup and had been pulling strings behind the scenes. "He immediately surrounded himself with people who invoked fear in Venezuela" complained one official[who?] about Cormona. "Obviously, this coup was very poorly coordinated. It caught the democratic opposition by surprise." The Miami Herald reported that "moderate politicians complained that Carmona, a centrist businessman, had been 'hijacked' by rightists". Speaking afterward about his one-day presidency, Carmona told The Miami Herald that he had been "misunderstood because ... the opposition wasted too much time forming a cabinet and naming the high military command", whereas if the coup had "been hatched in advance, those key decisions would have already been made". He regretted not stressing his plan to appoint "a 35-member representative council to help him run the nation" and to hold assembly elections in 90 days and a presidential election (in which he would not run) in December. He said he had suspended the assembly "because the new government would never have accomplished its goals with a congress so stacked to favor one party". He also denied any link to Carlos Andrés Pérez. "There is no connection between me and him", Carmona said. "I did not receive one cent from him. I am not manipulated." "There was no rebellion or coup" Carmona told The New York Times after the counter-coup. "There was simply a vacuum of power that came about after the military announced the resignation of the president." Carmona said he had accepted the interim presidency because he was told by military officers that Chávez had resigned. "I was called by them to fill that role", he said. "I was called by officers and others to take over. And I had the courage to take that step." He told The Guardian that he took "full responsibility" for the actions he made, emphasizing that "there was no premeditation, no conspiracy" behind the coup and his elevation to the presidency. He said that after the April 11 march on Miraflores, he had been phoned by someone (whom he would not name) who said that Chávez had quit and offered him the presidency. "Everything happened so fast that mistakes were made", Carmona said. "If I could go back in time, I would have had a triumvirate, the power would have been shared – but everything was so quick." When asked if he had been "used by the military", he replied: "There might have been people who used me, you never know what is going on underground", but he insisted that he "acted purely in the higher interests of the country". One Western diplomat told The Miami Herald that during Carmona's brief presidency "everybody was saying what a great guy he was, professional, straight, ethical" but that after his ouster "everyone is pointing fingers at him for being a dope". Carmona himself told the Herald that he would remain a "civic activist" but would leave politics: "I have never been a politician; that is not my world", Carmona said. "As for Venezuela, we will continue the struggle." In addition to Carmona's errors, his coalition partners made several missteps. The first was to refuse to let Chávez leave the country, as he asked, and in return for which he promised, on Thursday, to officially resign. This request was not honored because hard-line members of the coalition wanted to prosecute Chávez for the killings outside Miraflores. It was Chávez's refusal to resign – he described himself as "a prisoner president" – that ultimately split the anti-Chávez coalition. Also, the coup-makers were criticized for raiding the homes of some Chávez supporters, including Tarek William Saab, chairman of the congressional Foreign Relations Committee, and Ramón Rodríguez Chacín, Minister of the Interior and Justice. Chavista loyalists gathered outside of Miraflores Palace after hearing that Chávez had not resigned the presidency. Prompted by the spreading news that Chávez had not resigned, Carmona's installation as President generated an uprising by Bolivarian Circles in support of Chávez that was suppressed by the Metropolitan Police. It also led to a demonstration outside the Presidential Palace by hundreds of thousands of people. According to one commentator, "it was the poor from the peripheral barrios who returned Chávez to power." With the palace surrounded by protestors, and with several hundred paratroopers still ensconced beneath the palace, their commander, José Baduel, telephoned Carmona to tell him that he too was as much a hostage as Chávez was, and gave him an ultimatum that he return Chávez alive within 24 hours. Meanwhile, General Raúl Baduel, who headed Chávez's old paratrooper division in Maracay, had been trying unsuccessfully to make public his opposition to Carmona; however, Venezuelan media refused to interview him. Baduel contacted the head of the Presidential Guard, which remained loyal to Chávez, and told him "it's now or never". Late in the morning of 13 April the Presidential Guard entered the palace from their barracks via underground tunnels, and retook the palace; many of the coup plotters escaped. Since Chávez was being held in a secret location, the presidency was assumed for several hours by Vice President Diosdado Cabello until Chávez was reinstated. After the retaking of Miraflores, the military coup plotters held a meeting in Fort Tiuna, and drafted a statement recognizing Carmona as President, but demanding the restoration of the country's democratic institutions. 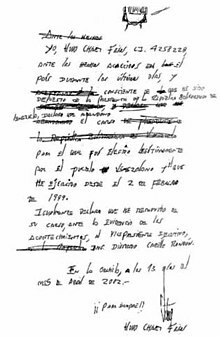 In the confusion of the meeting, Chávez ally Jorge García Carneiro crossed out the section recognising Carmona; and it was in this form that the statement was read to CNN (since no Venezuelan media would broadcast it). After the coup, Carmona was placed under house arrest, but was able to gain asylum in the Colombian embassy after an anti-Chávez protest drew away his security detail. Whilst Chávez was temporarily removed from office, the Caracas Stock Exchange saw liquid stocks reach record levels, with the index growing nearly 1000 points in a single trading session. When it became clear the coup had failed, the index fell again. With the increasing disapproval of Chávez in 2001 and constant confrontations with him, the Venezuelan media, which initially approved and supported Chávez, turned against him, which then accelerated his loss of popularity. The constantly growing interruptions Chávez's government made on television with their cadenas that they saw as "an overt attempt to block the independent news coverage of the strike", media organizations agreed on 9 April to create a split screen effect for cadenas that did not involve the president, only allowing full coverage for the president out of courtesy for him. A few hours after the meeting, the first split screen cadena coverage occurred while covering a speech by the labor minister. The media organizations also felt pressure from the government since DISIP and National Guard units were seen and posted near their communication towers, planning to cut transmissions of the media. At a 10 April meeting involving media representatives, Vice President Diosdado Cabello and Minister of Defense Rangel, the Venezuelan government blamed the media for the anti-government demonstrations, with Cabello stating the media would be "responsible for the blood that will be shed"; Globovision's president rejected this, saying the Venezuelan government had called on Chávez supporters to confront opposition marches near Miraflores. The use of the split screen for the cadena had also been criticized by Rangel though the media owners said that the effect would continue to be implemented. On 11 April, the anti-government march, the message "remove Chávez", and the call to redirect the march to the presidential palace in Miraflores, were "widely announced, promoted, and covered by privately owned television channels, and whose explicit support for the opposition became evident." At the beginning of the coup, Venezolana de Televisión (VTV), the state television channel, had its workers leave in droves, fearing for their lives since they believed they were targets like in the bloody takeover during the 1992 coup led by Chávez. Then opposition-controlled police allegedly shut down VTV whilst police efforts were made to shut down community radio and television stations. As a result, the news that Chávez had not in fact resigned was largely kept out of the Venezuelan media, and spread by word of mouth; only one Catholic radio network continued to broadcast the developing news. Chávez was able to get word out that he had not in fact resigned, via a telephone call to his daughter, who, via switchboard operators at Miraflores still loyal to Chávez, was able to speak first to Fidel Castro and then to Cuban television. The Attorney-General attempted to make public Chávez's non-resignation via a live press conference supposedly to announce his own resignation; most of his statement was cut off, with Venezuelan networks returning to the studios. At 3:45 pm Chávez called for another cadena, though it was possibly prerecorded in order to distract Venezuelans since government officials reported that Chávez was speaking to them during the broadcast. Broadcasting from an underground location in the palace grounds, Chávez appeared unaware of the violence that was occurring outside and "disconnected from reality", speaking for ninety minutes on the successes of his administration and calling for peace. With the networks concerned that history was in the making and that Chávez was attempting to block a government massacre, half an hour into the cadena the networks decided to split the screen again, showing the violence outside the palace, with the audio from the cadena appearing disrupted. The video also appeared pre-recorded when Chávez called for the networks to be disconnected due to actions performed on 9 April and not the present day. Shortly after Chávez ordered the networks taken off the air, they were disconnected, with Chávez saying that networks are licensed by the state, but "they can't use that right to attack the state itself, to instigate violence, or, knowing there is an insurrectional plan, support it..." However, a single engineer tricked DISIP and National Guard members into thinking he cut all transmission, though the networks continued to broadcast via satellite to cable, satellite and through other outlets. Controversially, private television stations were able to share a video of pro-government chavistas allegedly firing at protesters. Although who was responsible for the deaths remains unclear (see below), and that video evidence later emerged indicated that the gunmen were possibly firing back at police in self-defense, the media aired the footage "non-stop" as part of an anti-Chávez campaign. The footage served as a "bombshell" that triggered greater military participation in the coup. A steady stream of ads asked Venezuelans to participate in the insurrection. RCTV had also sent its reporters to quiet parts of town for "live shots of tranquility" and allegedly ignored the events. On 13 April, the media met with Carmona at Miraflores and denounced his decision to dissolve the National Assembly and arrest supporters of Chávez. Such opposition to Carmona's moves resulted in his Minister of Defense, Admiral Hector Ramirez Perez, stating that the media was "opposed" to Carmona's interim government. Carmona's Minister of Defense also called on the media to stop reporting the violence so it would not provoke more violent actions. The head of Globovision reportedly called to CNN in Atlanta "to request the U.S. network join the blackout." Venezuelan television media failed to broadcast news of Chávez supporters retaking of the Miraflores palace; the four major television networks stopped providing news reports altogether. The St. Petersburg Times reported that "RCTV was showing Walt Disney cartoons. Venevisión ran a daylong marathon of Hollywood movies: Lorenzo's Oil, Nell and Pretty Woman. Another station, Televen, told its viewers 'to stay indoors,' treating them to baseball and soap operas. Globovisión, the country's top 24-hour news station and CNN affiliate, spent much of the day rebroadcasting upbeat footage of Chávez's ouster. An announcer repeatedly cautioned viewers, 'We are living in times of political change'" while also urging viewers to remain "prudent" and not to spread "false alarms" or "rumors". According to the media, such actions were performed for safety reasons since there were threats against the media organizations. Two of the three major newspapers El Universal and El Nacional cancelled their Sunday editions, for safety reasons. The third major newspaper, Últimas Noticias, printed a limited Sunday edition accurately reflecting events; some tabloids and regional television stations also covered the news. Chavez supporters on 13 April were also creating an intimidating atmosphere, attacking the offices of RCTV, breaking windows and shouting "The palace is in our hands, why aren't you showing that?" When CNN announced the rebellion against the coup of a key military division in Maracay (commanded by General Raúl Baduel), "CNN expressed amazement that the press were saying nothing." After Chávez loyalist forces had re-taken Miraflores, the military coup plotters drafted a statement demanding the restoration of democracy; it had to be read to CNN studios since no Venezuelan media would broadcast it. Only by 8 o'clock on 13 April was the reinstalled government able to inform the people of the situation, via state television channels. On 18 April, Globovision president Alberto Ravell "asked for forgiveness 'from any viewer who feels we failed them that day'", further stating that "Sacrificing our credibility ... and freedom of expression, we decided not to broadcast images of violence and looting.". By the time the Organization of American States' (OAS) Permanent Council met on 13 April, the coup was effectively over, and on 14 April the United States ("albeit with little enthusiasm") joined with other OAS members in condemning the coup and sending the OAS Secretary General on a fact-finding and diplomatic mission. The OAS subsequently established a "mesa" dialogue process, as it had in Peru following the May 2000 elections. At Chávez's request, the Carter Center and UNDP were also involved. In order to facilitate participation in this process, the anti-Chávez opposition created the Coordinadora Democrática (CD). However, the Coordinadora Democrática continued to pursue non-electoral means to overthrow the government, and was involved in organising the Venezuelan general strike of 2002–2003. After the February 2003 collapse of that strike, the CD was much more willing to engage with the mesa process, and pushed for a binding recall referendum under Article 72 of the Constitution of Venezuela, which was ultimately agreed on 23 May 2003. Ultimately the CD rejected the outcome of the Venezuelan recall referendum, 2004, which saw 59% of the vote for Chávez, despite the OAS and Carter Center's authentication of the result. Early on the morning after the coup, opponents of Chávez filled the streets of Caracas, "honking horns and waving the gold, blue and red of the Venezuelan flag", according to The New York Times. A headline in El Universal read "It's over!" Oscar Garcia Mendoza, president of the major bank Venezolano de Creditor, ran a "gigantic newspaper ad" celebrating Chávez's ouster, which, he wrote, would "substantially improve Venezuelan society". "This is the day that Venezuelans have been waiting for", said Luis Vicente Leon, head of a Caracas polling firm. "The situation in Venezuela has changed overnight, not only politically but also economically." About 500 protesters gathered outside the Cuban embassy in Caracas demanding an end to diplomatic relations and the expulsion of 1,000 Cuban teachers, doctors and sports trainers. Protesters cut the mission's utility cables, slashed tires, and smashed the windshields of three cars with diplomatic plates. Although the Cuban ambassador told a Venezuelan official that he was not sheltering any Venezuelans, he would not allow the building to be searched. A Rio Group meeting of Latin American governments in Costa Rica taking place soon after the coup adopted a resolution condemning the "interruption of constitutional order in Venezuela", and requesting a meeting of the Organization of American States (OAS); only Francisco Flores of El Salvador said that he would recognise the Carmona government. The United States government blamed the events on the actions of the Chávez government and said Chávez had resigned the presidency, dismissed his cabinet, and that security forces under his command had fired upon unarmed protesters. Upon news of Chávez's return, Condoleezza Rice, National Security Advisor to US President George W. Bush, said, "We do hope that Chávez recognizes that the whole world is watching and that he takes advantage of this opportunity to right his own ship, which has been moving, frankly, in the wrong direction for quite a long time." Bush denied any involvement of the US government in the coup attempt and asked Chávez to "learn a lesson" from it. Cuban president Fidel Castro later confirmed that after the coup his government had "contacted the ambassadors of 21 countries in an attempt to get a plane to Venezuela to rescue Chávez." In Chile, newspapers circulated information soon after the coup attempt showing the Chilean government's "discomfort" with Chávez returning to power, with President Ricardo Lagos holding Chávez accountable for the political crisis in Venezuela. President Lagos later clarified that his statements were to tell Venezuela to avoid polarization and the Chile opposes the "interruption of institutional order". Don MacKay of the Canadian Foundation of the Americas was troubled by the coup, saying: "This is the first time in a decade the military has stepped into power in Latin America. It is very troubling. ... This will be a test case to see whether the OAS's democracy clause has any teeth." Cuban Foreign Relations Minister Felipe Pérez Roque said that in the eyes of his country Chávez was still president, and Cuba's Communist Party daily, Granma, wrote that Chávez had been "overthrown in a conspiracy by the country's wealthy classes, corrupt politicians and the news media". On 13 April, the editors of The New York Times applauded what they incorrectly described as Chávez's resignation, calling him a "ruinous demagogue" and cheering the fact that "Venezuelan democracy [was] no longer threatened by a would-be dictator". The Times editors also wrote admiringly of the installation of Carmona as president, describing him as a "respected business leader". Furthermore, the Times congratulated the U.S. government for its wisdom in "never [having] publicly demonized Mr. Chávez, denying him the role of nationalist martyr", and in staying out of the coup, which the Times characterized as "a purely Venezuelan affair". Statements of President Chávez over a potential coup involvement of the United States are varied. Shortly before the coup attempt, Chávez dismissed possible hostility from the United States, since "times had changed". After the coup, however, Chávez asserted numerous times that United States government officials knew about plans for a coup, approved of them, and assumed they would be successful, alleging that "two military officers from the United States" were present in the headquarters of coup plotters. Chávez would also state after the coup that there was "little evidence" that the United States orchestrated the plan. Rear Admiral Carlos Molina, a central leader of the coup, later said that "We felt we were acting with US support ... we agree that we can’t permit a communist government here. The US has not let us down yet." However, the United States repeatedly informed the Venezuelan opposition that they would not be supported if there were a coup, warned the Chávez government of the plot and following the coup attempt, President George W. Bush denied the United States' involvement. The United States learned of details about a potential coup in late-2001 due to the nature Venezuelan individuals openly plotting to overthrow President Chávez. In March 2002 only days after United States Ambassador to Venezuela Charles Shapiro began his duties in Venezuela and just weeks before the coup attempt, Shapiro met with a trade union organization. During this meeting the group openly shared their desire to be part of the coup, with Ambassador Shapiro informing them that the United States would not support such actions and that governmental change should only occur electorally. On 27 April 2002, Chairman Cass Ballenger and Congressman Bill Delahunt of the United States also met with Venezuelan media heads of Venevisión, Globovisión, Unión Radio, El Nacional, Últimas Noticias and El Mundo, telling them that "the U.S. was opposed to any disruption of constitutional government and would condemn any coup, open or disguised, aimed at ousting Chavez". At a meeting soon after the coup between Ambassador Shapiro and then Venezuelan Vice President José Vicente Rangel at the Vice President's home, Rangel also stated to Shapiro that "no one in the upper echelons of the Venezuelan government really believed that the United States was involved in the attempted overthrow" and that if the Venezuelan government did believe so, "the two men wouldn't have been sitting in Rangel’s house". However, unlike much of Latin America, the US refused to condemn the coup, changing its position only after a popular uprising led Carmona to resign. The British daily The Guardian was told in April 2002 by Wayne Madsen, a former intelligence officer with the US navy, that his country's navy had lent assistance to coup organizers by providing them with intelligence from its vessels in the Caribbean. Its sister paper, The Observer, established that the coup was "tied to senior officials in the US government" after receiving information from OAS officials that the US was not only aware of the coup, but also gave sanction to its organizers. The paper names Elliot Abrams, who had been convicted of deceiving Congress during the Iran Contra Affair, as being the one who greenlit the coup. In December 2004, The New York Times reported on the release of newly declassified intelligence documents that showed that the CIA and Bush administration officials had advance knowledge of an imminent plot to oust President Chávez, although the same documents do not indicate the United States supported the plot. According to Chávez activist and author Eva Golinger in her 2006 book The Chávez Code, on 5 March 2002, the US Embassy cabled Washington to report that Fedecámaras, the CTV, and the Catholic Church had reached an agreement named "Bases for a Democratic Accord", which the cable described as "ten principles on which to guide a transitional government". An Embassy official, commenting in the cable, said of the accord "another piece falls into place... This accord... may well form the frame of reference and code of conduct for a transitional government." Also in March 2002, the CIA was briefing US officials that a coup might be planned, and on 6 April it issued another brief saying efforts to mount a coup were possibly being stepped up. The 6 April brief noted that "To provoke military action, the plotters may try to exploit unrest stemming from opposition demonstrations slated for later this month or ongoing strikes at the state-owned oil company PDVSA." The United States embassy in Venezuela then allegedly informed Chávez of a possible coup, though Chávez ignored their warnings. The New York Times notes that the documents used by Golinger do not show direct involvement of the U.S. government in the coup attempt; instead, they show that U.S. officials issued "repeated warnings that the United States will not support any extraconstitutional moves to oust Chávez," whilst nonetheless talking only "broadly" to Mr. Chavez about opposition plans, and "provid[ing] few hard details of the looming plot". The documents were obtained, through Freedom of Information Act requests, and released by Eva Golinger "as part of an offensive by pro-Chavez activists to show that the United States government has, at least tacitly, supported the opposition's unconstitutional efforts to remove the president". In addition to the CIA documents, The New York Times reported that Golinger also obtained "reams of documents from the National Endowment for Democracy, a nonprofit agency financed by the United States government, that show that $2.2 million was spent from 2000 to 2003 to train or finance anti-Chávez parties and organizations". Bush Administration officials acknowledged meeting with some of the planners of the coup in the several weeks prior to 11 April but have strongly denied encouraging the coup itself, saying that they insisted on constitutional means. However, the purpose of the meetings was not clarified, and it is also not known why US officials and the Venezuelan opposition broached the subject of a coup months before the attempted ousting took place. In addition, The New York Times quotes an anonymous Defense Department official in charge of developing policy towards Venezuela as saying that, "We were not discouraging people. ... We were sending informal, subtle signals that we don't like this guy. We didn't say, 'No, don't you dare'", though he denied the Defense Department offered material help, such as weaponry. Because of the allegations, an investigation conducted by the US Inspector General, at the request of US Senator Christopher Dodd, requested a review of American activities leading up to and during the coup attempt. The OIG report found no "wrongdoing" by US officials either in the State Department or in the Embassy, and concluded that "While it is clear that NED’s, DOD’s, and other U.S. assistance programs provided training, institution building, and other support to organizations and individuals understood to be actively involved in the events of April 11–14, we found no evidence that this support directly contributed, or was intended to contribute, to those events. NED is, however, mindful of the fact that, in some circumstances, its efforts to assist specific organizations, or foster open elections, could be perceived as partisan." Gallery of the violence and other images related to the coup. The shooting of opposition marcher Jesús Orlando Arellano by a pro-Chávez gunman, resulting in the first fatality of the day. Photographer Jorge Tortoza being shot and killed followed by protester Malvina Pesate being shot in the face from pro-Chávez crowd. Pro-Chávez gunman Erasmo Sánchez being carried away after being shot by returning fire from the Metropolitan Police. He was the reportedly the first pro-Chávez fatality of the day. The majority of the violence that took place on 11 April 2002 was near the Llaguno Overpass. There is no consensus as to who was responsible for the deaths on that day, and this remains a very controversial issue. The opposition version of events puts the blame on Chávez, or at least on his supporters. Many groups of the Bolivarian Circles gathered near the Llagano Overpass before the march reached the area. A Venevisión camera positioned on a rooftop that afternoon captured images of people using handguns to shoot from the pro-Chávez counter-march being held on the Llagano Overpass, an overpass that crosses one of central Caracas's busiest avenues; it is unclear who they are shooting at, but the opposition narrative is that they were shooting at the opposition march and responsible for the deaths. Supporters of Chávez have alleged that the opposition conspired to cause casualties during the incident with Chávez allies such as Jorge García Carneiro and Lucas Rincón Romero claiming that[dubious – discuss] CNN correspondent Otto Neustald said that on the morning of 11 April he recorded a video message from a number of high-ranking military officers, led by Vice Admiral Héctor Ramírez, which was broadcast later in the day. The message responsabilized Chávez of massacring innocent people using snipers, referring to at least six dead and dozens wounded. [dubious – discuss] According to Neustald, the message was recorded at least two hours before the killings started. However, this claim has never been proven and is contested by the rest of the reporters present, such as Javier Ignacio Mayorca, Mayela León and Adrián Criscaut, who affirmed that the military officers were informed of the death of Tortoza during the filming of the message. The Chavista gunmen that were seen shooting off the bridge argue that they were, in fact, returning fire at unknown snipers and Metropolitan Police firing towards them. There are reports that claim seven were arrested at the Hotel Ausonia and that they were later freed in the chaos of the coup while there was also empty shells found at the Hotel Edén. According to Chávez supporter Gregory Wilpert, video and audio recordings were allegedly provided at the trial of Metropolitan Police leaders which suggested plainclothes police had infiltrated the La Nacional building and were allegedly sniping on the opposition marchers and police below. [dubious – discuss] The La Nacional building housed the offices of pro-Chávez mayor Freddy Bernal. Bernal, a Chávez supporter and former leader of an elite police force, was accused by a Venezuelan military officer of complying with orders from the Defense Ministry to shoot opposition demonstrators. It was also reported that the National Guard, which was firing tear gas and combatting the opposition protesters, did not pay any attention to the gunmen on the La Nacional building and that it was the Metropolitan Police who had attempted to go to the building. Bernal dismissed the allegations as "totally false". The 2003 documentary titled The Revolution Will Not Be Televised shows footage captured from another angle by an amateur cameraman of the gunmen firing while the street below is portrayed to be empty; although another documentary, X-Ray of a Lie and American academic Brian Nelson argue the former's footage is manipulated and obscures Metropolitan Police on the street below. The 2004 documentary Puente Llaguno: Claves de una Masacre claimed that the Chavistas on the bridge did not begin shooting until 4:38 pm, by which time most of the opposition deaths had already occurred. Some of the victims, both opposition and Chavistas, were claimed to be shot in locations not reachable from the bridge, being around corners from the main street with an eyewitness[who?] with military experience, who was shot himself, reported most victims being killed with precise head shots. In addition, most of the opposition deaths were at least 300 yards away from the bridge, supposedly too far to be killed by the Chavistas' pistols with the precise head shots witnessed. According to Nelson, such claims are false showing that opposition demonstrator Jesús Arellano was killed just before 2:30 pm, with photos showing Chavistas further up the street brandishing firearms and closer than purported by the earlier sources. Within the next 15 minutes, two other opposition demonstrators were shot at 2:45 and 4:30 pm, the Metropolitan Police responded to the Chavista gunfire by going between the marchers and the Chavistas. The Chavistas responded to the Metropolitan Police by moving further up the street and at around 4:35 pm, began firing down from Llagano Bridge onto Baralt Avenue below. Police responded to the Chavista gunfire, with one Chavista who was laying on the bridge being shot in the face, with his body positioning of lying down and facing the Metropolitan Police below possibly resulting in the headshot. Ricochets were also possible from Chavistas ranks firing through the spokes of the railing on the bridge. After 5:30 pm when most of the gunfire concluded, the filmmakers of The Revolution Will Not Be Televised used manipulated footage, according to Nelson, in order to show an empty Baralt Avenue that Chavistas were overlooking. A vehicle used by the Metropolitan Police later showed that approximately 600 bullets impacted the vehicle's side that was facing north toward the Puente Llaguno bridge. In 2012, Nelson concluded after a five-year investigation that sharpshooters were not involved in the conflict and that the day's violence began when several Chávez supporters standing at street level fired handguns into a crowd of protestors; opposition-led Metropolitan Police later returned fire, leading to injuries and deaths among both government opponents and supporters. The people filmed shooting from the Puente Llaguno bridge were initially identified as being pro-Chávez political activists Rafael Cabrices, Richard Peñalver, Henry Atencio, and Nicolás Rivera. They were captured by the police and jailed for one year as they awaited trial, but charges were dropped before the trial began. Rafael Cabrices died from a heart attack three years later, in August 2005. Under the 1999 Constitution, military officers are entitled to a pre-trial hearing before the Plenary of the Supreme Court of Justice to rule on whether they should be charged with a crime. In such a hearing on 14 August 2002, the Tribunal ruled by an 11–9 margin (with two justices recused) that four high-ranking military officers charged with rebellion should not stand trial, arguing that what took place was not a "coup" but a "vacuum of power" that had been generated by the announcement of Chávez's resignation made by Gen. Lucas Rincón Romero. After Chávez allegedly took over of the Supreme Tribunal of Justice and filled it with his supporters, the Constitutional Chamber of the Supreme Court, however, ruled on 12 March 2004 that the recusals were unconstitutional, making the hearing invalid and which meant that the military officers (by then retired) should stand trial. After a trial that had begun back in March 2006 which had seen "265 expert testimonies, 5,700 photos, 20 videos and 198 witnesses", in April 2009, the ten Metropolitan Police officers were convicted of crimes leading to the deaths of three demonstrators back on 11 April 2002. Six of them, charged with homicide, were sentenced to 30 years each in prison. Only one officer was found "not guilty". Former President of the Supreme Court (TSJ), Eladio Aponte Aponte, who fled Venezuela in 2012 after the Venezuelan government accused him of alleged ties to drug trafficking and removed him from his post, reportedly told U.S. authorities that he was personally ordered by President Chávez to use the full weight of the court to condemn the officers. On 18 November 2004, a leading state prosecutor Danilo Anderson was assassinated shortly before he was scheduled to bring charges against individuals for their alleged participation in the coup. The Venezuelan government claimed individuals from Florida planned the assassination, though other reports suggested that Anderson and others were involved in an extortion racket. Meanwhile, Carmona and several other participants went into exile. In December 2007, Chávez issued a pardon covering more than 60 people who had drafted or signed the Carmona Decree. Before the coup, the relationship between Chávez's government and the media were in dispute over press freedom, with the Venezuelan government threatening to revoke licenses of media organizations. Venezuelan media officials stated that the majority of the media supported Chávez and the change he promised when originally elected in 1998, but after they reported the "negative realities" occurring in Venezuela, the Venezuelan government began to portray the media as an enemy. After Chávez removed many of the traditional political elements that were barriers to his power, the Venezuelan media, like other forms of media in Latin America, began to criticize the government. In 2001 and 2002, relations between the media and Chávez deteriorated quickly. The Chávez-controlled Supreme Court ruled in June 2001 that the media could be held accountable for "half-truths", a ruling which Chávez used to threaten media organizations by saying he would be revoking their licenses. As conformations began to grow, both parties became more biased, with media owners down to reporters feeling threatened with Chávez even calling out individual journalists by name in speeches. By January 2002, Chávez supporters were attacking independent reporters, with the headquarters of El Universal assaulted by hundreds of Chavistas, Globovision reporters attacked while they were attempting to record Aló Presidente and a bomb attack on newspaper Así Es la Noticia. As a result of being "besieged" by Chávez, the media lost its perspective and began to increase its political involvement assisting the opposition. According to Le Monde diplomatique, mainstream Venezuelan media outlets such as El Universal, El Nacional, El Nuevo País, Globovisión, Televen, CMT and RCTV supported the coup and anti-government demonstrations, accusing the media of only disseminating the anti-Chávez point of view in the news reports of international media agencies and organizations. Following the coup attempt, the Venezuelan media was blamed as being a major contributor to the unrest in Venezuela with one Foreign Policy article, supporting the statements by Le Monde diplomatique about the media's involvement, stating, "Never in the history of Latin America had the media played quite so prominent a role in facilitating the overthrow of a democratically elected government," noting that "the majority of private outlets in Venezuela were owned by wealthy families with an interest in ousting Chávez." Senior Research Fellow for the leftist thinktank Council on Hemispheric Affairs and Chávez supporter Nikolas Kozloff wrote that Venevisión owner Gustavo Cisneros was "widely reported" to have bankrolled the coup and that he had hosted the coup plotters, including Carmona, at both his mansion and network offices, supposedly leading Newsweek to place Cisneros "at the vortex of the whole mess." Opposition legislator Pedro Pablo Alcántara later said of Carmona's regime, "This government was put together at Gustavo Cisneros' office." Such allegations of Venezuelan media owners' active involvement in the coup has never been proven, but the media's actions in supporting the anti-Chávez movements hurt its credibility in the future. Media outlets denied allegations of any political bias or involvement, stating that coverage was impeded by the confusion of the coup. This included the confusion from rumors such as "Chávez had resigned, been arrested, was fleeing to Cuba, that the military had revolted, that the military high command had resigned" as well as the violent targeting of media personnel that left six cameramen shot, with one of those mortally wounded. Media outlets that both opposed and supported Chávez reported difficulties in reporting due to the potential danger their reporters faced, stating that journalists were afraid to cover pro-Chávez demonstrations since the media was targeted. Venevison reported that only 5 of 18 reporters went out to cover events during the coup while a newspaper considered pro-Chávez stated that they had to remove their logo from cars so they would not be attacked by Chávez supporters. It was also reported that the Chávez supporting Bolivarian Circles surrounded media buildings which prevented their reporters from leaving the area. According to a declassified document from the United States State Department, then-Congressmen Cass Ballenger and William Delahunt met with five media outlet owners and presidents following the coup attempt to encourage the media "to contribute to a climate that would make possible the dialogue and reconciliation that President Chavez has called for." The media owners and presidents, who admitted there may have been mistakes during the coup attempt, said "the media is democratic" and was opposed to any coup. The media officials also stated that they were attempting to give Chávez a second chance but remained skeptical, noting his 14 April speeches after returning to power where he admitted errors and asked for forgiveness, but later gave a "fiery speech" where he said to his supporters that those responsible for the coup attempt, including the media, "must pay". Annual World Press Freedom Index rankings of Venezuela from Reporters Without Borders. Chávez said after his reinstatement as president, "This coup d'etat would not have been possible without the help of the news media, especially television", and began a campaign to establish a "media hegemony" to prevent similar media conduct from happening in the future. To do so, Chávez used a "two-pronged strategy" in which his government strengthened its own media and "closed, browbeaten or infiltrated almost every independent outlet". In 2004, the Law on Social Responsibility in Radio and Television was passed, allowing the government to censor media in order to "promote social justice and further the development of the citizenry, democracy, peace, human rights, education, culture, public health, and the nation’s social and economic development". The law, which was extended to the Internet and social media in 2010, requires media companies to "establish mechanisms to restrict, without delay, the dissemination of messages." Violators can be fined up to US$3,000 or 10 percent of one's yearly income, or face suspension of service, while journalists can be arrested with vague charges, including "conspiracy against the state" for criticizing the government. In 2007, Chávez revoked the license of leading anti-government broadcaster RCTV, and other stations began toning down dissent to avoid a similar fate. In 2009, 34 radio stations were closed for "technical and administrative reasons". By the time of Chávez's death in 2013, he left a transformed media atmosphere in Venezuela with the media organizations that opposed him being silenced and an expanding state media as a result. Media workers face legal barriers, defamation lawsuits from Venezuelan officials or are targets of violence. The Revolution Will Not Be Televised, also known as Chávez: Inside the Coup, is a 2003 documentary which focuses on events in Venezuela leading up to and during the April 2002 coup d'état attempt, which saw Chávez removed from office for several days. The film focuses on Venezuela's private media and examines multiple incidents, including the opposition's formation of an interim government, headed by business leader Pedro Carmona; and the Carmona administration's collapse. Another documentary made by Venezuelans Wolfgang Schalk and Thaelman Urgelles, X-Ray of a Lie, discusses what they allege as manipulation of the Irish production of The Revolution Will Not Be Televised. A documentary by Calle y Media, Venezuela Bolivariana, covers the events from 1989 to the 2002 coup attempt. The film is in Spanish with English subtitles. ^ Wilpert, Gregory. "The Venezuelan Coup Revisited: Silencing the Evidence". North American Congress on Latin America. Retrieved 15 May 2014. ^ a b c d Toro, Francisco (10 April 2012). "Remembering a Massacre". The New York Times. Retrieved 15 May 2014. ^ a b c d e f g h i j k l m n o Nelson, Brian A. (2009). The silence and the scorpion : the coup against Chávez and the making of modern Venezuela (online ed.). New York: Nation Books. pp. 1–8. ISBN 1568584180. ^ a b "Círculos bolivarianos protestaron" (in Spanish). Últimas Noticias. 13 April 2002. Archived from the original on 2 November 2003. Retrieved 11 April 2008. ^ a b c Bellos, Alex. "Chavez rises from very peculiar coup". The Guardian. Retrieved 8 February 2015. ^ a b Hawkins, Kirk A. (2010). Venezuela's Chavismo and populism in comparative perspective (1st publ. ed.). New York: Cambridge University Press. ISBN 9780521765039. ^ a b Yergin, Daniel (2012). The Quest: energy, security and the remaking of the modern world (revised & updated ed.). New York: Penguin Books. ISBN 0143121944. ^ "Veneconomía" (PDF) (in Spanish). Veneconomía. 15 March 2006. Retrieved 29 January 2010. ^ "Insurrección civil y militar termina con el golpe; Chávez, en Miraflores" (in Spanish). La Jornada. 14 April 2002. Retrieved 4 March 2007. ^ Hernández, Enrique (7 May 2002). "Capriles: "Nunca apoyé el gobierno de Carmona"" (in Spanish). Asamblea Nacional de la República Bolivariana de Venezuela. Retrieved 4 March 2007. ^ "Cecilia Sosa no ha sido notificada formalmente medida privativa de libertad" (in Spanish). Unión Radio. 21 October 2005. Archived from the original on 27 September 2007. Retrieved 4 March 2007. ^ a b Tobar, Hector; McDonnell, Patrick J.; Richter, Paul (22 April 2002). "Rapid-Fire Coup Caught Chavez Foes Off Guard". The Los Angeles Times. Retrieved 7 February 2015. ^ a b c d McCaughan, Michael (2010). Battle of Venezuela. New York: Seven Stories Press. ISBN 1609801164. ^ a b Lansberg-Rodríguez, Daniel (15 March 2015). "Coup Fatigue in Caracas". Foreign Policy. Retrieved 10 July 2015. ^ a b c d e f Forero, Juan (3 December 2004). "Documents Show C.I.A. Knew of a Coup Plot in Venezuela". The New York Times. Retrieved 15 May 2014. ^ a b "Venezuela coup linked to Bush team". The Observer. 21 April 2002. ^ a b c d e Simon, Joel (2014). The New Censorship Inside the Global Battle for Media Freedom. New York: Columbia University Press. pp. 47–48. ISBN 9780231160643. ^ a b c d e f g h Fossett, Katelyn. "How the Venezuelan Government Made the Media into Its Most Powerful Ally". Foreign Policy. Retrieved 8 February 2015. ^ "Venezuela is promised 'political revolution'". BBC. 2 February 1999. Retrieved 4 March 2007. ^ a b Simon, Joel (2014). The New Censorship Inside the Global Battle for Media Freedom. New York: Columbia University Press. pp. 44–45. ISBN 9780231160643. ^ a b c d Rory, Carroll (2014). Comandante: Hugo Chavez's Venezuela. Penguin Books: New York. pp. 59–70. ISBN 0143124889. ^ Rory, Carroll (2014). Comandante: Hugo Chavez's Venezuela. Penguin Books: New York. p. 41. ISBN 0143124889. ^ a b c d e f g h i j k l m "CODEL BALLENGER 4/27 DINNER WITH MEDIA OWNERS" (PDF). United States Department of State. Archived from the original (PDF) on 31 December 2016. Retrieved 16 February 2015. ^ Read, Oliver (28 December 2006). "Venezuela's Media Wrestles with Stigmas, New Rules". PBS. Archived from the original on 27 January 2007. Retrieved 4 March 2007. ^ a b Branford, Becky (13 August 2004). "Analysis: Chavez at eye of storm". BBC. Retrieved 4 March 2007. ^ a b c d e f g Nelson, Brian A. (2009). The silence and the scorpion : the coup against Chávez and the making of modern Venezuela (online ed.). New York: Nation Books. pp. 40–41. ISBN 1568584180. ^ Phil Gunson, Newsweek, 11 November 2001, "Is Hugo Chávez Insane?" ^ "FIRED OIL WORKERS LANGUISH IN THE POLITICAL CROSSFIRE" (PDF). United States Department of State. Archived from the original (PDF) on 31 December 2016. Retrieved 21 February 2015. ^ Margarita López Maya, "Venezuela 2002–2003: Polarization, Confrontation, and Violence", in Olivia Burlingame Goumbri, The Venezuela Reader, Washington D.C., U.S.A., 2005, p. 14. ^ a b c d e f g h i j k l m n o p q r s Nelson, Brian A. (2009). The silence and the scorpion : the coup against Chávez and the making of modern Venezuela (online ed.). New York: Nation Books. pp. 121–134. ISBN 1568584180. ^ a b c d Nelson, Brian A. (2009). The silence and the scorpion : the coup against Chávez and the making of modern Venezuela (online ed.). New York: Nation Books. pp. 20–22. ISBN 1568584180. ^ Nelson, Brian A. (2009). The silence and the scorpion : the coup against Chávez and the making of modern Venezuela (online ed.). New York: Nation Books. p. 50. ISBN 1568584180. ^ "PDVSA: THE HEAVY HAND OF HUGO CHAVEZ" (PDF). United States Department of State. Archived from the original (PDF) on 31 December 2016. Retrieved 9 February 2015. ^ "OPEP: crisis petrolera a la vista". BBC. 8 April 2002. Retrieved 25 April 2014. ^ U.S. Department of State, Bureau of Democracy, Human Rights, and Labor. 31 March 2003 Country Reports on Human Rights Practices – 2002. Retrieved 4 August 2006. Archived 11 August 2009. ^ a b "VENEZUELA'S WORK STOPPAGE – CREATION OF AN OPPOSITION COORDINATING COMMITTEE" (PDF). United States Department of State. Archived from the original (PDF) on 31 December 2016. Retrieved 8 February 2015. ^ a b ""PARO" UPDATE/GENERAL STRIKE ANNOUNCED" (PDF). United States Department of State. Archived from the original (PDF) on 31 December 2016. Retrieved 6 February 2015. ^ a b Nelson, Brian A. (2009). The silence and the scorpion : the coup against Chávez and the making of modern Venezuela (online ed.). New York: Nation Books. p. 51. ISBN 1568584180. ^ Nelson, Brian A. (2009). The silence and the scorpion : the coup against Chávez and the making of modern Venezuela (online ed.). New York: Nation Books. p. 13. ISBN 1568584180. ^ Espinoza, Ocarina (2005). "Sucesos de Abril de 2002: Tres días que marcaron la historia del país" (in Spanish). Unión Radio. Archived from the original on 22 August 2008. Retrieved 12 July 2007. ^ a b c d "TALE OF TWO CITIES – THE MARCH ON MIRAFLORES PALACE" (PDF). United States Department of State. Archived from the original (PDF) on 31 December 2016. Retrieved 5 February 2015. ^ a b Nelson, Brian A. (2009). The silence and the scorpion : the coup against Chávez and the making of modern Venezuela (online ed.). New York: Nation Books. p. 16. ISBN 1568584180. ^ Nelson, Brian A. (2009). The silence and the scorpion : the coup against Chávez and the making of modern Venezuela (online ed.). New York: Nation Books. p. 19. ISBN 1568584180. ^ Nelson, Brian A. (2009). The silence and the scorpion : the coup against Chávez and the making of modern Venezuela (online ed.). New York: Nation Books. p. 52. ISBN 1568584180. ^ a b c Nelson, Brian A. (2009). The silence and the scorpion : the coup against Chávez and the making of modern Venezuela (online ed.). New York: Nation Books. pp. 23–25. ISBN 1568584180. ^ a b c Nelson, Brian A. (2009). The silence and the scorpion: the coup against Chávez and the making of modern Venezuela (online ed.). New York: Nation Books. pp. 29–32. ISBN 1568584180. ^ Nelson, Brian A. (2009). The silence and the scorpion: the coup against Chávez and the making of modern Venezuela (online ed.). New York: Nation Books. pp. 29–30. ISBN 1568584180. ^ Nelson, Brian A. (2009). The silence and the scorpion : the coup against Chávez and the making of modern Venezuela (online ed.). New York: Nation Books. p. 34. ISBN 1568584180. ^ a b c Nelson, Brian A. (2009). The silence and the scorpion: the coup against Chávez and the making of modern Venezuela (online ed.). New York: Nation Books. pp. 41–44. ISBN 1568584180. ^ a b c Nelson, Brian A. (2009). The silence and the scorpion : the coup against Chávez and the making of modern Venezuela (online ed.). New York: Nation Books. pp. 103–106. ISBN 1568584180. ^ a b c d e Bart Jones (2008), Hugo!, p. 328. ^ a b Nelson, Brian A. (2009). The silence and the scorpion : the coup against Chávez and the making of modern Venezuela (online ed.). New York: Nation Books. pp. 134–137. ISBN 1568584180. ^ a b Harnecker, Marta. (Z Communications, 9 January 2003). "Lessons of the April Coup: Harnecker interviews Chávez". Retrieved 7 September 2010. ^ "Top former general breaks with Chavez over constitutional changes". CNN. 5 November 2007. Retrieved 31 January 2010. ^ "Venezuela: Chavez's key backers". BBC News. 19 March 2004. Archived from the original on 31 January 2010. Retrieved 31 January 2010. ^ a b c d Forero, Juan (13 April 2002). "UPRISING IN VENEZUELA: THE GOVERNMENT; VENEZUELA'S CHIEF FORCED TO RESIGN; CIVILIAN INSTALLED". The New York Times. Retrieved 13 September 2015. ^ McKenna, Aaron (9 March 2013). "Chávez was a charismatic leader – but his economic legacy should be a warning". TheJournal.ie. Retrieved 13 September 2015. ^ a b c d e f g h i Nelson, Brian A. (2009). The silence and the scorpion : the coup against Chávez and the making of modern Venezuela (online ed.). New York: Nation Books. pp. 73–78. ISBN 1568584180. ^ Nelson, Brian A. (2009). The silence and the scorpion : the coup against Chávez and the making of modern Venezuela (online ed.). New York: Nation Books. pp. 55, 72. ISBN 1568584180. ^ OAS, Agreement Between the Representatives of the Government of the Bolivarian Republic of Venezuela and the Political and Social Groups Supporting It, and the Coordinadora Democratica and the Political and Civil Society Organizations Supporting It, Caracas, 23 May 2003. ^ Bellos, Alex (15 April 2002). "Chávez rises from very peculiar coup". The Guardian. Retrieved 20 July 2006. ^ a b "US 'likely behind' Chavez coup". Al Jazeera. 21 September 2009. Archived from the original on 26 September 2009. Retrieved 23 September 2009. ^ a b "MEDIA REACTION: VENEZUELA AND DEMOCRACY" (PDF). United States Department of State. Archived from the original (PDF) on 31 December 2016. Retrieved 9 February 2015. ^ Rory, Carroll (2014). Comandante : Hugo Chavez's Venezuela. Penguin Books: New York. pp. 82–83. ISBN 0143124889. ^ "U.S. Cautioned Leader of Plot Against Chávez". The New York Times. 17 April 2002. ^ "American navy 'helped Venezuelan coup'". The Guardian. 29 April 2002. ^ Golinger, Eva (2006). The Chavez Code: Cracking U.S. Intervention in Venezuela. Interlink Books. p. 65. ISBN 9781566566476. ^ "US 'gave the nod' to Venezuelan coup". The Guardian. 17 April 2002. ^ "Bush Officials Met With Venezuelans Who Ousted Leader". New York Times. 16 April 2002. ^ Nelson, Brian A. (2009). The silence and the scorpion : the coup against Chávez and the making of modern Venezuela (online ed.). New York: Nation Books. p. 23. ISBN 1568584180. ^ Meza, Alfredo; Lafuente, Sandra. "V". El acertijo de abril (in Spanish). La Hoja del Norte. p. 134. ISBN 978-980-7212-14-4. ^ a b c [[Larry Rohter|Rohter, Larry]] (25 June 2010). "Oliver Stone's Latin America". The New York Times. Retrieved 22 September 2015. ^ Nelson, Brian A. (2009). The silence and the scorpion : the coup against Chávez and the making of modern Venezuela (online ed.). New York: Nation Books. p. 59. ISBN 1568584180. ^ a b c Nelson, Brian Andrew. "A PHOTOGRAPHIC CHRONOLOGY OF THE VIOLENCE ON BARALT AVENUE". BrianAndrewNelson.com. Retrieved 12 August 2015. ^ Bart Jones (2008), Hugo!, pp. 323–324. ^ "LOS POLICÍAS SENTENCIADOS". El Universal. 7 April 2013. Retrieved 13 August 2015. ^ "Falleció de un infarto Rafael Cabrices" (in Spanish). Radio Nacional de Venezuela. 30 August 2005. Archived from the original on 30 September 2007. Retrieved 4 March 2007. ^ Sentencia de los Militares Archived 28 April 2005 at the Wayback Machine. (in Spanish) Retrieved 17 November 2005. ^ TSJ (2005). "T1 ST04 N5" (PDF). Tribunal Supremo de Justicia. Retrieved 9 June 2006. [dead link]. ^ "VENEZUELAN POLITICAL PROSECUTIONS UPDATE" (PDF). United States Department of State. Archived from the original (PDF) on 1 January 2017. Retrieved 8 February 2015. ^ "U.S. to Grill Venezuelan Judge Seeking Refuge". The Wall Street Journal. 19 April 2012. Retrieved 10 August 2015. ^ "A confession letter by former justice Aponte Aponte is revealed". El Universal. 13 September 2012. Retrieved 8 February 2015. ^ "Ex juez afirma que Chávez ordenó condenar a grupo opositor". Diario Dom. 14 September 2012. Retrieved 8 February 2015. ^ Gunson, Phil (3 February 2005). "Bribe allegations emerge against slain prosecutor". The Miami Herald. Archived from the original on 20 February 2005. Retrieved 11 April 2015. ^ Maurice Lemoine, Le Monde Diplomatique, August 2002, (French)"Coups d'Etat sans frontière", (Portuguese)"Golpes Sem Fronteiras". ^ Castillo, Antonio. "Breaking Democracy: Venezuela's Media Coup" [online]. Media International Australia, Incorporating Culture & Policy, No. 108, August 2003: 145–156. Availability: <http://search.informit.com.au/documentSummary;dn=013180178483702;res=IELLCC> ISSN 1329-878X. [cited 10 May 12]. ^ Kossen, Emile. "Hugo Chávez: Oil, Politics, and the Challenge to the U.S (review)". Academia.edu. Retrieved 16 February 2015. ^ Nelson, Brian A. (2009). The silence and the scorpion : the coup against Chávez and the making of modern Venezuela (online ed.). New York: Nation Books. p. 26. ISBN 1568584180. ^ "News that's fit to print". The Economist. 19 October 2013. Retrieved 30 June 2015. ^ a b c Simon, Joel (2014). The New Censorship Inside the Global Battle for Media Freedom. New York: Columbia University Press. p. 51. ISBN 9780231160643. ^ Hornaday, Ann (12 December 2003). "In Venezuela, A Filmmaking, & Political, Coup". The Washington Post. ^ Schiller, Naomi (30 September 2009). "Framing the Revolution: Circulation and Meaning of". Mass Communication and Society. 12 (4): 478–502. doi:10.1080/15205430903237832. ^ "Venezuela bolivariana: pueblo y lucha de la IV guerra mundial" (in Spanish). IMDB.com. Retrieved 12 March 2013. U.S. Department of State and Office of Inspector General. A Review of U.S. Policy toward Venezuela, November 2001 – April 2002.. Retrieved 26 May 2006. A full-text PDF report of the U.S. Inspector General report of U.S. involvement. U.S. Embassy, Caracas, Venezuela. State Dept. Issues Report on U.S. Actions During Venezuelan Coup: (Inspector General finds U.S. officials acted properly during coup).. Retrieved 26 May 2006. A summary from the U.S. Embassy in Caracas, Venezuela of the report on U.S. actions during the events of April 2002. This page was last edited on 6 April 2019, at 03:53 (UTC).